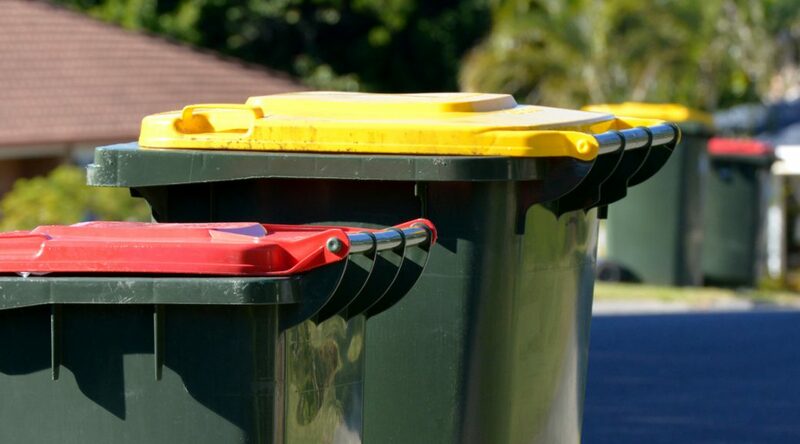 The importance of recycling to the Australian community, industry and local councils has been further reinforced by recent developments in China. The act of sorting, separating and recycling our household recyclable materials is something that the public and councils consider an essential service. It is good for the environment, meets community expectations and generates positive economic activity. Equilibrium has been working with the Metropolitan Waste and Resource Recovery Group (MWRRG) to develop a tool* to assist local councils and kerbside service operators to assess changes to contracts in the current environment. 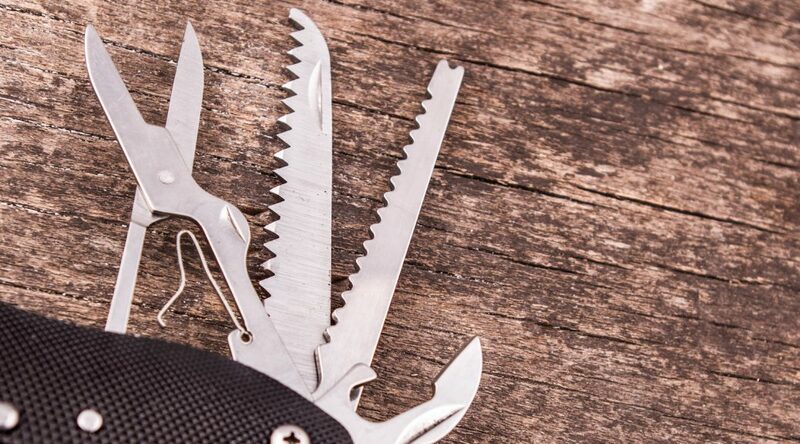 The methodology underpinning the tool is not intended to be prescriptive, but more so a guide that councils and others can use as it suits their particular circumstances and requirements. The tool includes instructions, examples and indicative responses to make it as easy to use and as stand-alone as possible, and to enable individual organisations to adapt it to their situation. The MWRRG is now using this approach with Victorian Councils, and it has been widely circulated to all States, major recyclers and industry groups. 1. Principles of kerbside recycling services. 2. Considerations for assessing kerbside recycling service arrangements. 3. Commodity price indices, factors and calculations to inform financial considerations. The tool is straightforward to use and organisations can use it to check and test their own particular situation. The need to confirm, verify and certify processes and outcomes is a major element in responsible and measurable environmental management, be it to establish accurate disposal paths, quantify recovered materials or document a robust chain of data and activity. From forestry and fisheries through to energy, carbon reduction and abatement programs and the recycling and recovery of waste, the need for unassailable digital tools is an essential part of responsible environmental management and business sustainability in the broadest sense. How often do we hear about the need for effective ‘chain of custody’ for materials or a particular product, or for certified recycling outcomes? 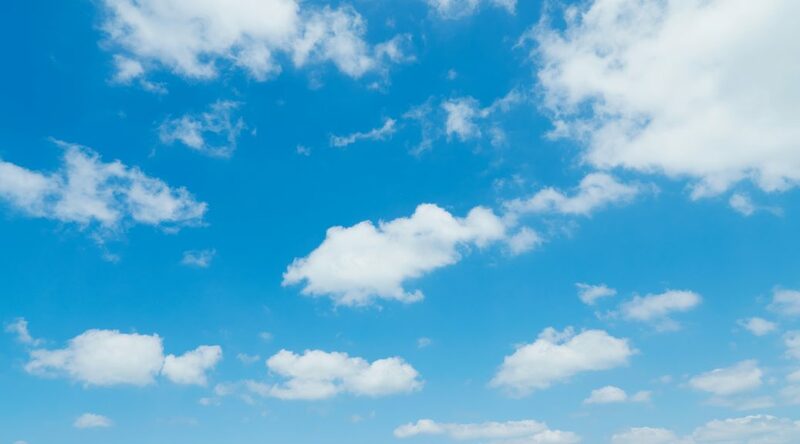 Digital solutions that are free of any single vested interest, and have the architecture to enable transparency and widespread adoption, will allow organisations, and their sustainability practitioners to reach new levels of knowledge transfer, environmental performance, supplier accountability and customer confidence. There are plenty of definitions with a recurring theme but it’s all about decentralization through a platform ‘owned by no one and useable by everyone’. In very simple terms it’s a ‘shared record book’. 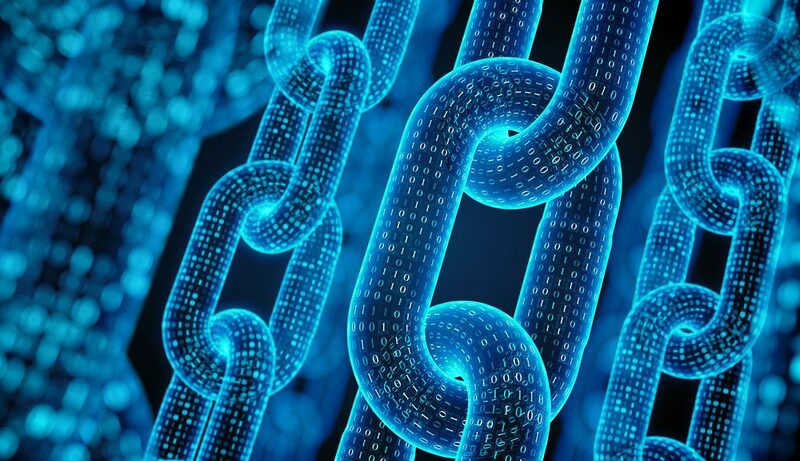 Because the “chain” can’t be modified it can immediately provide proof of purchase for any transaction, whether that be procurement of sustainable materials to purchasing renewable energy. Fundamental to the structure of blockchains is the ability to maintain encrypted copies of any information stored on every server or “node” in the network. Blockchain systems record all transactions, enabling a transparent trail that can be easily audited, even automatically which can be used to validate transactions preventing double counting and the authenticity of chain of custodies around products and materials. So could the blockchain be part of the transparency revolution that business sustainability demands? 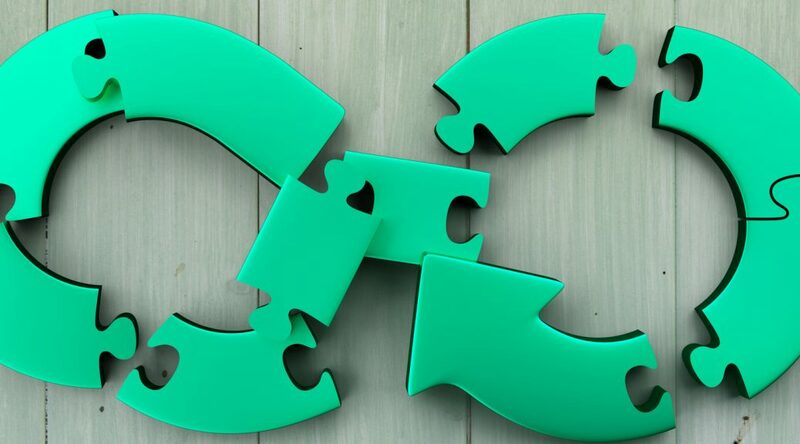 Heather Clancy, the editorial director of GreenBiz talks about the blockchain’s emerging role in sustainability in a manner that is both plausible and compelling. The scenarios she describes are clear candidates highlighting how a ‘shared record book’ can bring noteworthy environmental benefit and customer confidence through the ultimate in transparent platforms. Clancy however is a realist and acknowledging the hype but certainly not dismissing the blockchain and its future applications. While lavish claims and embellishment are the norm for early innovations and over-excited entrepreneurs, there is a logic and clarity around why and how the blockchain can address data and verification gaps not always possible or reliable via conventional methods and systems. IBM — sells a private cloud service that could help organizations develop and get blockchain applications up and running quickly. Its technology is behind pilots by retailer Walmart, for food safety, and Everledger, which certifies the origins of diamonds. Nasdaq — has been investing in blockchain technology for more than three years. Its Linq service could be the foundation for new business models, such as a system for issuing renewable energy credits automatically. Provenance — a relatively low-key London firm has piloted the use of blockchain to track tuna supply chains in Indonesia and to monitor produce for British grocer Co-op Food. It wants to make it simpler for companies to verify sustainability claims. Skuchain — the California startup’s software is behind a test by Commonwealth Bank and Wells Fargo initially focused on trading cotton between Texas and China. The World Economic Forum has also been proactively discussing the relevance of the blockchain and its role in helping deal with climate change and resource conservation. New uses and applications emerge weekly which also highlights that the platform has captured the imagination of innovators and entrepreneurs, as well as the major financial institutions who have much to gain and lose should they not understand its potential. > Plastic Bank: uses blockchain technology to pay for the collection of plastic in poverty-stricken areas reducing the overall waste. > Poseidon+: carbon credit market that will allow consumers to purchase climate positive products and having the confidence to trust it because of blockchain tracking. > Catenaut: is blockchain made for a timber supply chain, knowing where the timber comes from and the amount coming in accurately. Ultimately the blockchain delivers a degree of transparency that in fact spawns new uses, or improved uses compared to conventional, less-secure methods and systems. Its success and widespread application will in part depend on compelling, evidence-based case-studies that stimulate thinking across sectors and industries, including energy, water, waste, mining, agriculture and fisheries. If the blockchain can achieve a step-change improvement in relation to accurate data sharing, verification, monitoring and tracking, then we are likely to see greater uptake over the coming months and years. And if its application can directly and indirectly contribute to achieving a more resource efficient and productive sustainable future then its value-adding capacity is noteworthy. It could also be the platform that helps to underpin the circular economy and its focus on extending the life of products, components and materials to unprecedented levels. Transparency combined with closed loops is a powerful partnership in pursuit of regenerative and restorative solutions. Equilibrium are proud to be associated with Maxi Cosi as part of the the Child Car Safety Seat Recycling Program. Australia’s Hazardous Waste Act regulates the export and import of hazardous waste into and out of Australia by way of the Basel Convention, Organisation of Economic Co-operation and Development Decision and the Waigani Convention. As a party to these conventions and agreements, Australia has an obligation to ensure that the stewardship legislation that applies to our waste and exporting activities does not impact on international destinations. As such, Australia’s responsibilities and obligations to the export of end products as a direct result of product stewardship activities lies with the manufacturer/producer and should not be contracted out to buyers, sellers, brokers or agents without appropriate due diligence. Australia’s product stewardship arrangements are not alone or protected from ensuring that exported materials through the supply chain go to an environmentally sound use. This will become more important as new product stewardship programs are developed which could result in waste, that is not classified as hazardous in accordance with the Act its regulations, undergoing further treatment (dismantling for product recovery) or used in facilities (for example for energy recovery, energy generation or pyrolysis) that don’t have the same stringent controls in place to protect the environment or safeguards in place to protect the health and safety of workers. Other by-products might even be illegally dumped or incinerated. With a number of Australian industries signalling a strong intension to move towards a circular economical way to value product and service inputs and outputs, we need to become smarter as to how we assess our downstream supply chains and in particular health and environmental impacts. Equilibrium has started a review of international programs with the aim of providing guidance to Australian companies to ensure that they aren’t just providing a burden to other countries and enduring reputational risk but rather ensuring exported materials are destined for an environmentally sound use. This guidance is expected to be completed in early 2017. Child Car Safety Seats – What a Valuable Waste! Sitting and gathering dust in a garage and waiting for the right time to pass on your used child car safety seat to a friend or relative may soon be a thing of the past. Child car safety seats that have been involved in an accident or have been mistreated could result in damage to a number of the key safety components. Continuous exposure to heat and sunlight, something Australia’s climate serves up best, could also degrade the plastic structure and other important parts. It has been found that the average consumer has little knowledge about the existence of recommended expiry dates and the continuingly updated Australian Standards applied to the manufacture of child car safety seats – which in turn has an impact on the suitability of seats to protect children and infants over a period of time. Removing potentially unsafe or worn or damaged child car safety seats from the market will not only protect children and infants, but could provide an opportunity to responsibly divert these products from landfill and implement an efficient resource recovery and recycling program. Without a means to effectively remove child car safety seats from the public domain, expired and damaged seats may remain in circulation. They could be offered for sale in online stores such as Gumtree and eBay, illegally dumped on the side of a road or removed from kerbside hard rubbish collections to only be reused again. 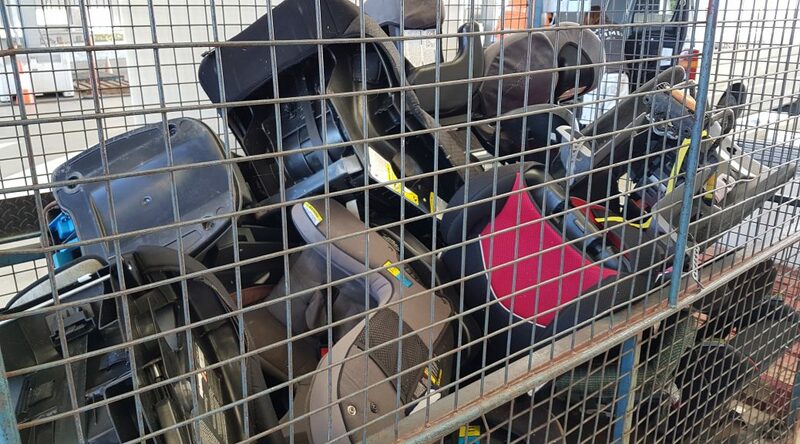 There are currently no general programs or schemes within Australia to enable parents to responsibly dispose of and/or recycle child car safety seats. With a growing population and demand for new products, the cost to Governments and communities for the collection and disposal of child car safety seats will only increase. 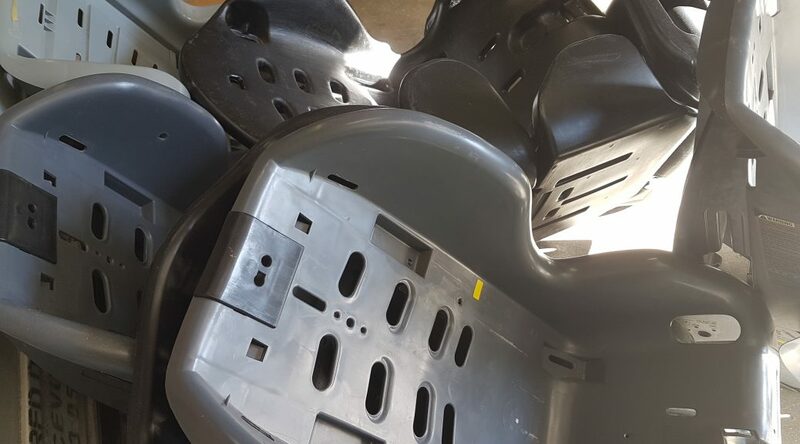 Setting up a product stewardship and recycling program presents an opportunity to reduce the end-of-life child car safety seats being reused, sold or ending up in landfills which is what Equilibrium, an Australian based sustainability consulting and management company, is hoping to achieve. Equilibrium will be bringing together a number of key stakeholders from product importers and manufacturers, retailers, automotive clubs and recyclers in early October 2016 to explore how a voluntary product stewardship program might be established to manage the whole of life cycle of a child car safety seat and significantly increase resource recovery and recycling as a result of providing an avenue to return and recycle end-of-life systems. Mattress recycling has been a nightmare for many years, but we can all now sleep a bit easier as new approaches will be putting the problem to bed. TIC Mattress Recycling has built Australia’s first automated mattress deconstruction facility, located in Melbourne’s western suburbs, and is on track to have another plant up and running in Sydney before the end of 2016. The technology breaks down the problems that have plagued local government and consumers – namely that mattress recycling in Australia has to date been dogged by unsustainable operators, boom and bust cycles, and poor environmental and safety outcomes. Indeed, TIC’s technological development has renewed government interest and support in mattress recycling, and the sector is poised to increase the recovery and recycling of mattresses nationally. In January 2016, the New South Wales Government through the NSW Environmental Trust announced a $794,000 grant to TIC to enable fast-tracking of automated and advanced end-of-life mattress recycling for NSW. TIC Mattress Recycling managing director, Michael Warren, says his company’s approach automates mattress deconstruction to provide greater economies of scale, improved environmental outcomes, and reduced health and safety risks. Estimates are that between 1.2 and 1.5 million mattresses are disposed of in Australia each year and, according to a November 2012 study, 85 percent of end-of-life mattresses could be ending up in landfill. The study, ‘Options for a Pilot Project to Increase Recycling of Mattresses’, was done for the Western Australian Department of Conservation and Environment and found significant resources were being lost due to lack of recycling. Another issue for policy-makers, local government, mattress manufacturers and retailers is that even the mattresses being recovered for recycling are often poorly managed, resulting in very low levels of resource recovery. TIC says local government, in particular, should be aware of the price it pays for ‘recycling’. Warren says he has seen councils choose providers because they offer a marginally cheaper service. Having said that, Warren says TIC is not against shredding and size reduction of mattresses in limited circumstances. “Soiled, wet and damaged mattresses may be best shredded where handling and processing will cause safety risks or are deemed impractical,” he says. Mattresses are readily recyclable. On average, Australian mattresses weigh 30 kilograms and the steel, foam and textiles that are readily recyclable account for between 24 and 26 kilograms of material. A 2015 study for the Victorian Government’s Metropolitan Waste and Resource Recovery Group (MWRRG) by Mobius Environmental found that the problem is growing. In Melbourne alone in 2015 the report found there were 427,000 new mattresses sold, and retailers report they are selling more mattresses every year as the population increases and mattress life decreases. The report, ‘Mattress Recycling in Melbourne and Greater Geelong’, found that, of the mattresses being collected for recycling, almost half were being shredded. This resulted in the situation that from all of the mattresses being ‘recycled’, 45 percent of the materials were actually still going to landfill. The report also identified high levels of illegal dumping and that local government continues to carry the bulk of the costs for collection and recycling. In a recent statement, chief executive of MWRRG, Rob Millard, says the report supports councils moving to new procurement models in order to drive good environmental and financial outcomes. “Using these findings we will work with councils to develop best practice approaches, seek processing options from the market and create new collective procurement contracts to recycle mattresses from council hard waste collections and transfer stations,” says Millard in the statement. TIC’s Michael Warren says current recovery practices rely on manual dismantling or shredding of whole mattresses and, while effective to an extent, these approaches have limitations and cannot meet government and community expectations. Many parts of the world have now enacted more stringent regulations and product stewardship schemes, and are rapidly implementing more sophisticated programs and driving more mattress recycling. The US, the UK, Canada and many countries in Europe are pursuing high resource recovery processes and growing mattress recycling. In the US, a strong independent product stewardship scheme for mattresses has been established and California, among other states, now requires a levy of US$11 for each mattress sold. The money goes into a mattress recycling scheme where consumers can dispose of end-of-life mattresses for free and recycling is carried out by authorised recyclers to an audited standard. The explosion of regulation and product stewardship overseas has fuelled interest in TIC’s technology. While Warren won’t detail specific enquiries, he says TIC is in advanced discussion with six other countries that want to purchase the technology. Australian governments – national and state – have so far declined to support a product stewardship scheme for mattresses. A select group of Australia’s mattress manufacturers and retailers have commenced discussions to establish a take-back scheme; however, proposals to date still require consumers and local government to pay the cost of mattress collection and recycling. Warren says he supported product stewardship and any such scheme must be open, transparent and accountable. “The key objectives of product stewardship are to respect the waste hierarchy and share waste management costs,” he says. TIC Mattress Recycling commenced operations in 2013 with a combination of manual and automated processes and, with the new facility now being commissioned, is transitioning to fully automated operations. TIC’s technology is based on the RetourMatras system from the Netherlands that has been further developed over the last two years and tailored for Australian conditions.